I’ve been in limbo. I know. Several years ago, I deliberately overdosed and died in the ambulance. They revived me, but I’ve never forgotten where I went. For me, there was no bright light or welcoming aura. I was suspended in time and space in a dark and empty place. Certainly it was peaceful, but I knew nobody else was there with me. Ever since that experience, I have prayed for people who take their own lives because I have known the absolute despair that leads to the act. I pray that they find the love and the warmth of other souls, and that they are not lonely. If they are in limbo, where I was, I pray to heaven to forgive their desperation. Most suicides die alone. I almost did. But here I am, back on earth for now, praying for souls in limbo as I was–or perhaps still am. I’ll have to die to find out. 5:00 in the morning…it makes me think about catching planes, wandering half-asleep through airports, waiting most of the time–waiting to go home, or worse, waiting to leave home. They put me on a plane to spend time at a rehab. 40 days, and, as Joe Friday said, “It’s all dead time.” I was supposed to spend 90 days in another place, but I’d had enough. I went home and back to graduate school, but that wasn’t the right choice either. So I shut myself in, sheltered by my ex-husband, and there I have remained ever since, our failed marriage only a blip in the radar of our 28-year friendship. 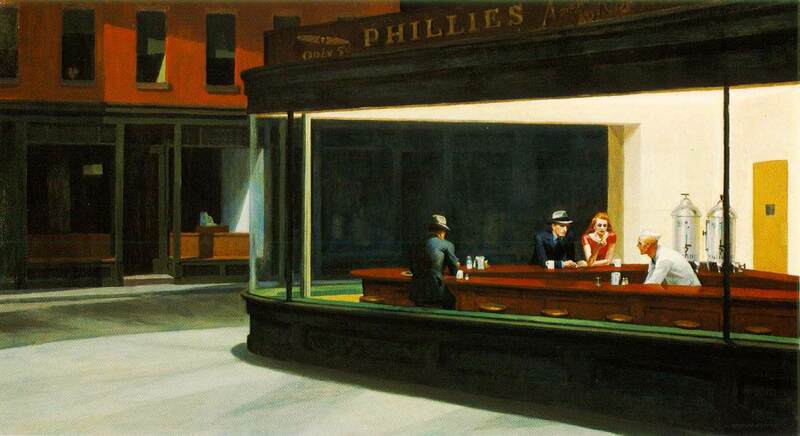 Edward Hopper’s Nighthawks is a portrait of what 5:00 AM looks like, or used to look like, back when a person could get a cup of coffee and cigarettes at the local all-night diner and talk to someone at the counter. Ah, but those days are over. They tore down the diner and built a McDonald’s there. So, if you want to get out of the house, nothing is open at this hour. If you drive anywhere, you might get stopped by a bored cop who wants to know where you’re going. I spent about twenty minutes sitting in my car one night waiting for a cop to run my DMV and discover I have a spotless driving record. At this rate, you might as well stay home and watch TV…but at 5:00 AM there’s nothing on television but evangelists, infomercials, and young news anchors who are stuck trying to be cheery while talking about last night’s shootings, automobile accidents, and the latest way someone has destroyed someone’s life or property. If you drink, by now the buzz has faded, and the hangover is just beginning. If you don’t drink, and you’ve been awake all night, as I have been, you reach for a pill…or two…maybe more. I used to have a deck of cards that I took everywhere to pass the time playing Solitaire. When my grandmother was alive, she and I were fierce double-Solitaire competitors. No one could beat either one of us. I haven’t played it since she died. There’s no one left to play it with. This is the time of day when somebody decides to deliver bad news over long-distance. It’s just before dawn, the time when dying souls leave their bodies and disappear. Conversely, there’s no one to call if you need comfort. No one to talk to. I understand now why people over 50 are awake at this time. You’re growing old, you’re scared, agitated or depressed, and everything that ever happened to you in your life rolls around inside your skull until you want to scream. Time for more pills. Lately, I think about death a great deal. My sweet little cat is dying of cancer. He doesn’t want to die, and gets up every day to have breakfast and sleep in the sun at the back door. He was only diagnosed a month ago, but he’s already lost most of his weight and he’s wasting away. When I pick him up, just to hold him for a few minutes, all I feel is skin and bone. Worst of all, he doesn’t trust me anymore. Can’t say that I blame him. All I have done since he got sick is take him to the vet where they performed tests on him, prescribed pills that I had to shove down his throat, analgesic lotion to rub in his ears, and syringes to stick him for pain medication. He got tears in his eyes the first time I treated him. He doesn’t understand why I am punishing him his way, making him feel so awful. For me, it’s torture upon torture. I love him so much, but he never runs to greet me anymore, never lies on my bed to snuggle up and sleep at night, never purrs when I pet him. He sleeps on the floor in my ex-husband’s room, far away from me. Of all the people who contract cancer, my cat deserves it the very least. He never did anything evil in his whole life–a life that began with us 10 years ago when some horrible person dumped him on the street. The little black kitty was thin, hungry, frightened and feared strangers, but in time he became a cheerful, happy, funny, sweet creature who gave us nothing but joy. It was always good to see him, and he was always happy to see us. Now, it’s devastating to see him so determined to live while everybody around us urges me to “put him down.” Well, no. I’m not God. I can’t make that decision. A human can ask to be euthanized in some countries. Humans are capable of asking for that knowing well what the procedure will be. But all my cat would understand is that he would be taken into strangers’ hands to restrain him and stick into his veins two syringes filled with two kinds of medicine, one to paralyze him, and one to stop his heart. Who’s to say he won’t be aware of that when it happens? Who knows how much it will hurt? Nobody has an answer to that. All he would know is that he couldn’t move or breathe. That’s no way for a cat to die–or for anyone to die. With every day he grows weaker. This morning he refused his breakfast. He visited his litter-box and then went to lie in the patch of morning sun in the room where he sleeps. He still has control over himself, and he has maintained his dignity throughout this ordeal. It will be his decision when to close his eyes and breathe his last. For him, there will be no limbo–only sweet, lasting peace. This entry was posted in Uncategorized and tagged cancer, cat, God, Joe Friday, Louis Armstrong, Solitaire, suicide by wildautumnwind. Bookmark the permalink.